In October 2016 German photographer Peter Granser (b. 1971) walked into a cave on the Paradajs mountain in rural Slovakia. His newest work deals with the grief after the loss of his father, but despite the darkness it evokes a sense of transformation, beauty and hope. We took a chat with Granser to learn more about his project I walked into a cave and up to Paradajs. Since we stumbled upon the photo project Sun City we have kept an eye on the work of Peter Granser. There was something about his use of color, framing and sensibility that managed to turn a retirement colony in the American southwest into a place of hope and wonder. In earlier works – like Coney Island or Signs – Granser captures underlying stories by framing minor details, making the normal seem less ordinary and the odd perfectly human. In 2016 Granser published his book El Alto with beautiful photographs of the surreal buildings by self-taught Bolivian architect Freddy Mamani Silvestre. Since 2005 Mamani Silvestre has realized more than 60 projects in his hometown El Alto, Bolivia – all in his signature style which is best described as an inca-futuristic, art deco fantasy. The book is a brilliant example of Granser’s way of observing the oddities of our planet and the lives of those who inhabit and shape them. Obviously we wrote Granser the instant moment we saw this book in an urge to know more about the project, but as we realized, something much more important filled his life by the time. “Thank you for writing and for your interest in my work. Unfortunately I don’t have any time at the moment. My father died last week. There is still a lot to do and I have to support my mother. From October 10th and on I will be in the countryside of Slovakia for a residency and I want to focus on something new,” Granser replied kindly to our email. We sent Granser and his family our deepest empathy and time passed on. Actually one and a half year went by. Then a new message from Granser landed in our inbox: “It’s been a while and I hope you are doing fine,” he wrote followed by the news of his newly published artist’s book. I walked into a cave and up to Paradajs is the result of the residency that he went on shorty after the loss of his father and at first sight you’ll probably spot that something in his style has changed. The photos are in black and white, the motives are cleared of people and human-made objects, and the underlying stories are of a much more psychological and private nature. Where Granser went after the loss was dark, but as the title reveals the work also took him through a process; up to Paradajs. We took a chat with Granser to learn more about his recent project, how it differs from his earlier works, his thoughts on the unorthodox book binding and how he dealt with the process of grief and art-making in parallel. Peter Granser, I walked into a cave and up to Paradajs (Artist's book). Hi Peter, first of all, will you tell us a bit about yourself? Sure. I was born in Hannover, I have the austrian citizenship and I am living in Stuttgart in the south-western part of Germany. I started my first project Sun City in 2000 and have published nine books since 2003. Book number 10 will follow this year. Besides from working with photography, I opened the project space ITO 2,5 years ago after spending several months in Japan at residencies. It had quite an impact on me. At ITO I combine contemporary art with high-grade japanese tea. A tea table for 4 people functions as a space for communication within the exhibition. It’s a challenging experiment. This passion for tea has also led me to the creation of my project The Tea Garden. I am autodidact. Some years before Sun City, I met a photographer, got interested in photography and after some first attempts I started to work for magazines. But I wanted to work on long-term projects and make books, so I saved up some money and started with a lot of passion. You started working on your recent project I walked into a cave and up to Paradajs shortly after the loss of your father in October 2016. Would you like to tell us about that time and how you dealt with the process of the project and your loss in parallel? I had an invitation for a residency in a small town in rural Slovakia, that was organized by art organisation Banská St a nica Contemporary and Goethe Institut Bratislava. Everything had been set for quite some time already, but then my father got very sick and died. I spent the last 3 weeks with him and as you can imagine it was an intense time. Just three days after the funeral I had to start my trip and I questioned, weather I would be able to concentrate on my work and be able to produce a new body of work. I really had my doubts. At the end I am glad that I went, because the residency gave me the time to focus on this period of loss and grief. To really undergo it. At home I would have been easily distracted by all the paperwork, that has to be done, after a case of death. I needed some days, before I was able to leave the house, where I stayed, but then I started to go on long hikes. On these hikes I literally walked into a cave and up to the highest mountain near that cave. The mountain’s name was Paradajs (paradise), so I actually found the title for my project before I had even finished it. I spent 3 weeks doing the same tour again and again and found myself in the thicket of the dark forests of Paradajs mountain. A forest in October gives you a feeling for impermanence and the cycle of nature. We are a part of it and it was good to feel that. Despite the darkness, I see beauty and hope in my photographs. Peter Granser, I walked into a cave and up to Paradajs (Special Edition). It's clear that a lot of thought went into the poetic book design. Can you tell us about these thoughts and why you chose to accompany your photos with the poem One moment passes by Robert Lax? Since 2014 my books are published by Edition Taube, an independent german art book publisher. I have developed an intense relationship with the graphic designers Jonas Beuchert, Tilman Schlevogt and Jan Steinbach. I walked into a cave and up to Paradajs was designed by Jonas Beuchert. I started the process together with him, but did most of the editing and sequencing in the final phase myself. I like to give a graphic designer I trust, a lot of freedom. I think that’s important for a good result. Jonas came up with the idea of turning the book inside out. The cover material was inserted in the center of the book, providing a stability from inside while the fragile cover will slowly age. The insertion divides the book in a “before” and “after”, which works perfect for me. I discovered the work of minimal poet Robert Lax in an exhibition in November 2016 right after I photographed I walked into a cave and up to Paradajs. His poems were a revelation for me. I think that his feeling for the moment and time works perfect in combination with my photographs. Peter Granser, I walked into a cave and up to Paradajs. Exhibition at ITO. The work has also resulted in an exhibition in which a sound installation is included and every 30 minutes you hear Lax reading the poem. He has a beautiful voice and I am very glad that the Robert Lax Foundation gave me the permission to use the poem for my project. The production was an important issue. 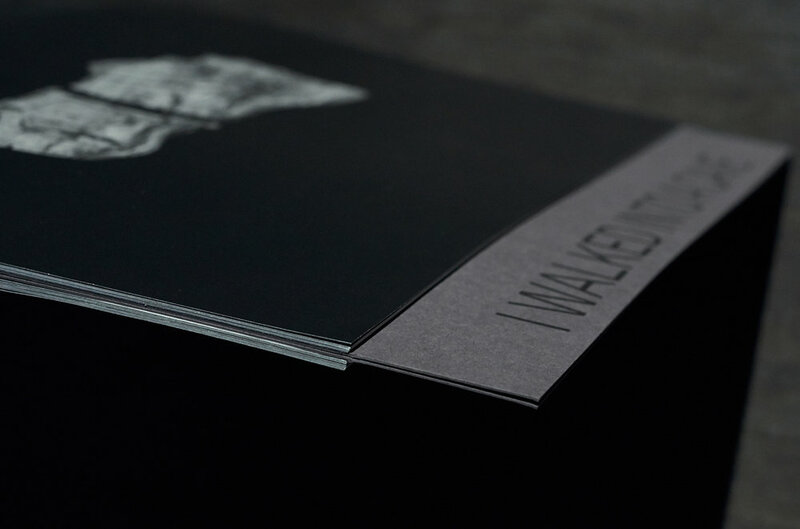 To achieve the dark, matt result, we were looking for, we worked with Carsten Humme who is an amazing pre-press expert and printed at DZA Altenburg. Both were important supports. How would you say that this project differs from your previous work? It is my most personal work. In my earlier work I was more focussed on what you see, today I am more interested in what you don’t see.